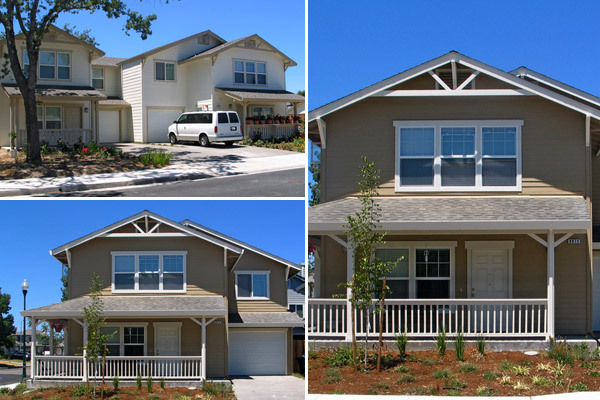 Los Amigos is an infill neighborhood of 17 detached and duet affordable homes. Designed for the Burbank Housing Development Corporation’s self-help sweat equity program in which the homeowners are required to construct a substantial portion of their homes, these homes average just over 1300 square feet in size, not including single car garages. Lot sizes average 3370 square feet. The porches of these 2, 3 and 4 bedroom homes face onto the new street that bisects the 1.92 acre site. Though designed for the simplicity of construction required for the self-help program, the two story homes display a scale on the street and elements such as porch railings, brackets and grouped single hung windows that evoke images of craftsman cottages. Permeable concrete driveways and bioswales integrated into the landscaping help provide environmentally sensitive storm water treatment.